Celebrating Leonard Bernstein's centenary with an intimate and detailed look at the public and private life of the Maestro written by his former assistant. Foreword by Broadway legend Harold Prince. "An affectionate portrait of an eminent musician who was driven by demons." "Harmon’s personable and warm account of what it was like to work for one of the twentieth century’s musical giants casts new light on Bernstein and his world." "This multifaceted perspective gives readers plenty of salacious gossip paired with insight into Leonard Bernstein’s remarkable artistic achievements later in life." Leonard Bernstein reeked of cheap cologne and obviously hadn't showered, shaved, or slept in a while. Was he drunk to boot? He greeted his new assistant with "What are you drinking?" Yes, he was drunk. Charlie Harmon was hired to manage the day-to-day parts of Bernstein's life. There was one additional responsibility: make sure Bernstein met the deadline for an opera commission. But things kept getting in the way: the centenary of Igor Stravinsky, intestinal parasites picked up in Mexico, teaching all summer in Los Angeles, a baker's dozen of young men, plus depression, exhaustion, insomnia, and cut-throat games of anagrams. Did the opera get written? For four years, Charlie saw Bernstein every day, as his social director, gatekeeper, valet, music copyist, and itinerant orchestra librarian. He packed (and unpacked) Bernstein's umpteen pieces of luggage, got the Maestro to his concerts, kept him occupied changing planes in Zurich, Anchorage, Tokyo, or Madrid, and learned how to make small talk with mayors, ambassadors, a chancellor, a queen, and a Hollywood legend or two. How could anyone absorb all those people and places? Because there was music: late-night piano duets, or the Maestro's command to accompany an audition, or, by the way, the greatest orchestras in the world. Charlie did it, and this is what it was like, told for the first time. Charlie Harmon is a music editor and arranger. From 1989 to 1999 he was the music editor for the estate of Leonard Bernstein, editing the first publications of full scores of West Side Story and Candide, and piano-vocals of On the Town and Wonderful Town, as well as new editions of 1600 Pennsylvania Avenue and Mass (all music by Leonard Bernstein). He has also worked in the orchestra libraries of the New York Philharmonic, the Vienna Philharmonic, the London Symphony Orchestra, and the Boston Symphony Orchestra. Now a freelance editor, he lives in Florida. A gossip-filled memoir of life with a musical superstar.In his debut book, music editor and arranger Harmon recounts in vivid detail four exhausting, exhilarating years as assistant to the mercurial maestro Leonard Bernstein (1918-1990). At the age of 30, the author was a clerk at a music library when he answered an advertisement to work for a "world-class" musician. The applicant, the ad noted, "must read music, be free to travel," and "possess finely-honed organizational abilities." 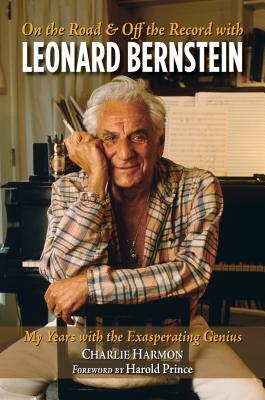 In the course of a three-hour interview, Harmon learned that the musician was Bernstein (called LB throughout the book), who was embarking on a strenuous schedule of performances around the world. The author was not sure he had the stamina for the job, which involved handling phone calls, mail, and appointments; packing and unpacking scores of suitcases for every trip; taking notes during rehearsals and performances; and—a task that proved especially challenging—making sure LB, infamous for his "celebrated libido" and drunken rants, did not generate negative publicity. Despite some reservations about his capabilities, in January 1982, Harmon set off with Bernstein and his entourage to Indiana University for a six-week residency, during which the composer began work on an opera. LB was a handful: demanding, impatient, and given to "bouts of fury and bratty behavior," which Harmon attributed to his enduring grief over his wife's death, in 1978. That behavior was exacerbated by heavy drinking and use of Dexedrine, fueling "drug-induced mania" followed by overwhelming depression. Drawing on his daybook, Harmon gives intimate accounts of LB's performances, teaching, creative process, and uncompromising standards—in the midst of a "three-ring circus" peopled by a large and sometimes-divisive cast of characters. Most troubling to Harmon was LB's imperious, "blatantly self-serving" manager, who wore Harmon down with cruel bullying. Exhaustion and depression eventually led Harmon to seek psychiatric help, though he admits that his intimacy with LB's musicianship gave him "a remarkable education." An affectionate portrait of an eminent musician who was driven by demons.